Hey Small Business Owner, How Strong Is Your Online Presence? If you own a small business, you know that online visibility is one of the keys to success. And these days, harnessing the Web is crucial to any marketing plan. “While most small business owners know they need a strong Web presence, many of them are not taking enough action to build and maintain it,” says Tim Carroll, Vice President of Small Business Engagement at Deluxe Corp., a provider of marketing services and products for small businesses. In fact, of those small business owners who put a high level of importance on Web presence, 70 percent spend less than one hour a week maintaining it, according to a new Deluxe study. In contrast, only 1.2 percent spend 10 or more hours each week on their Web maintenance. And Carroll offers some top tips for maximizing your company’s presence online. Since current and prospective consumers use social media, you can’t neglect this marketing approach. Social media marketing isn’t just about gaining followers. It becomes a vehicle for sharing your company’s message, as well as driving traffic to your website. This will ultimately help generate new customers and referrals. Many small businesses turn to consultants or social marketing services for help with developing and executing a social media strategy. When effective, these efforts will place a brand in front of its target audience. Small business owners should look for a service that also tracks results in order to gain insight into how its customers engage online. With 91 percent of Internet users utilizing search engines, according to the Deluxe-commissioned study, search engine optimization can be your key to better visibility online. After all, a website is hardly useful if no one can find it. Small business email marketing is the centerpiece of any effort to stay in touch with existing customers, while reaching out and finding new ones. Use it to promote new items and offer special discounts to loyal customers or to simply keep in touch. 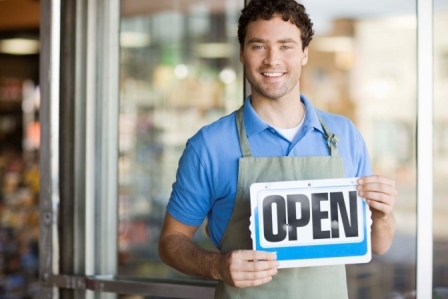 Small business owners know they need to be online. It just takes commitment and the right tools to capitalize on the potential. More tips, strategies and information about marketing your business online can be found at our website, www.Deluxe.com. For local Philly solutions, try Directline.com.